Just a few more weeks until Fancy Free is available! DESCRIPTION: The patterned paper with 36 squares of mini patterns is one of my absolute favorites in Fancy Free! So many possibilities with ALL of those patterns on one single sheet! Instead of cutting a little heart from 36 full-sized patterned papers, I've cut them all out from one paper. Nooice! JOURNALING SAYS: Shannon did such an amazing job capturing your big personality in one little photo! This is so you! Always playing. HOW TO: Trim the 36 squares paper into strips, fold each strip in half, then cut hearts from the folded edge (you know that technique?!). 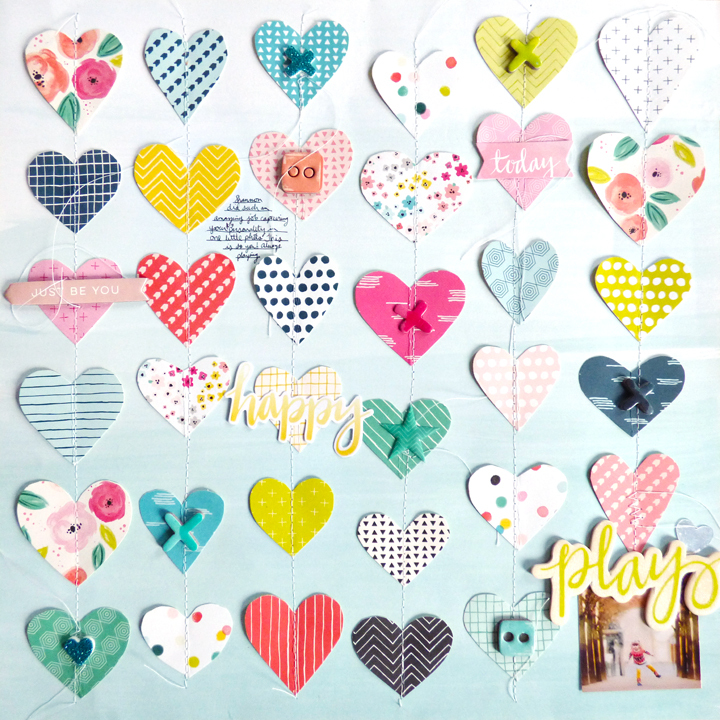 Arrange the hearts across the blue ombre paper then stitch them down for a garland effect. Leave the threads long for whimsy. Embellish with the color-on-color technique using chipboard, glitter foam stickers, and die cuts. Add a photo to the bottom right corner and place a wood veneer "play" piece on top. Journal between some of the hearts to finish. Patterned paper lovers: I'm so excited to see how you use this paper!!! Gorgeous! LOVING all the hearts!!!!!!!! !